Your $10 Donation Could mean $10,000 in prize money for LGBTQ+ youth in VA! Give OUT Day is a 24-hour online fundraising event that raises critically needed funds for nonprofit organizations that serve the LGBTQ+ populations across the US. It is the ONLY national day of giving for the LGBTQ+ community and it will occur April 18, 2019! Side by Side raised over $7,000 in 2018 through Give OUT Day. These funds went toward maintaining their commitment to providing supportive communities for Virginia's LGBTQ+ youth to define themselves. This year our goal again is to raise $8,000 and get 300 donors (which could get us up to an additional $10,000 in prize money)! All funds raised will be used to support youth in our community. 1. DONATE! 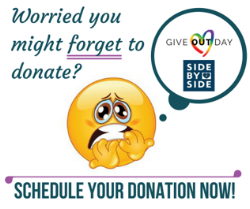 - Make a donation to Side by Side on Give OUT Day (4/18/2019) of $10 or more. All unique donations of $10 or more qualify Side by Side to win additional monetary prizes through Give OUT Day. You can join the Facebook Event to be reminded to make your donation online. Worried you might forget to donate on Give OUT Day you can make your donation now and schedule it to occur on 4/18/2019. 2. Attend our Happy Hour - Plan to attend our Give OUT Day Happy Hour Celebration (6:00pm-8:00pm) at Pasture (416 E Grace St) and invite friends and family as well! This event is a great chance to make your donation in person and connect with Side by Side staff, junior board members and fellow allies while having a great time! Expect music, food and fun! This is a 21 and up event! 3. Share your story - Share our Facebook posts to help broaden our reach and tell us why Side by Side matters to you.